For viewers who go to see Fermata, there are brochures (more like mini-books) that offer a sample image and brief statement about the work from each artist in the exhibition. I thought folks who can’t make it to the show/didn’t get a brochure might appreciate access to the info here. The show is only up until June 10: swing by, if you can. Ali Dadgar just responded to my original request to exploit him on the internet. 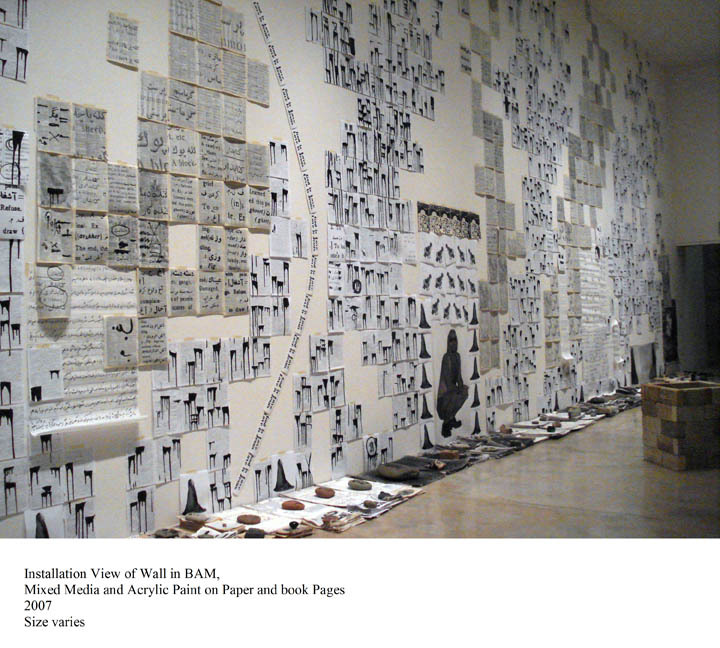 My recent work considers the aesthetics of the printed page: texts, charts, columns, and grids–the structures that make newspapers, photographs, dictionaries, and maps comprehensible. Intervening within these displays and arrangements of information, I focus on the surfaceness of the page, editing as I pull the page apart, creating new texts as I resurface the walls of my studio. If print culture represents the accumulated knowledge of a civilized society, its alteration conjures new meanings, linking literacy and illiteracy, knowledge and ignorance, artistic freedom and censorship. I attempt to constantly remind the viewer and myself of how meaning shifts and changes in translation and how the layout, design and composition of the page structure the content of information. I am curious about the socio-political implications of how information and meaning are presented and I use formal choices within my art practice to question and re-examine the content of the printed page. My digital prints integrate my work as a visual artist with my equally long-standing involvement in the performing arts in a very new way. These digital prints are generated from layers of staged photographic self-portraits as well as found photographs, cloths, rugs and postcards that are either integrated, re-composed and layered to create particular scenes. The prints are manipulated either through various digital techniques or with manual treatments like painting or drawing. These images attempt to create an iconic figure in a place filled with tradition and history. The post cold war nuclear Iran is the backdrop. This performative character is placed in an uncanny relationship with different spaces such as the cultural facades or religious interiors of Iran, a hyper-real estranged homeland from long ago visited in dream states. The main character is the otherness that moves through these hybrid places. This entry was posted on Saturday, June 2nd, 2007 at 1:28 pm	and is filed under -. You can follow any responses to this entry through the RSS 2.0 feed. You can skip to the end and leave a response. Pinging is currently not allowed.